Get the convenience of 2 pull-out drawers your tall open cabinets with the 11.5-Inch wide single basket wood sliding cabinet organizers Household Essentials. It has 2-tiers of storage twice the slide-out storage space. both top and bottom baskets are wood, with solid 3-Inch sides and solid flat bottom. that smooth bottom is ideal for storing small items that might tip in a wire-frame style of organizer. the 2 tiers Slidell and out together; the full extension vertical glides slide all the way out of the cabinet so it is easier to reach things stored far in the back! the vertical glides 2 inches high and can support up to 88 lbs.! the double basket fits well in bottom kitchen cabinets and bathroom vanities that are open. they essentially create drawers or slide-out shelves in the cabinet! glidez organizers install to the bottom of the cabinet with screws (hardware included). 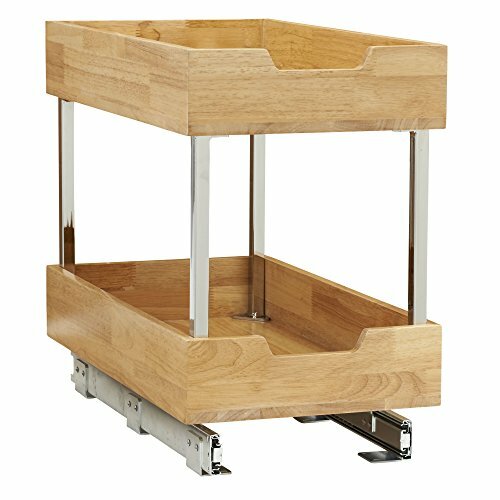 with chrome finish on the steel glides and upright poles, this sliding wood organizer is a perfect addition to your kitchen and bathroom storage and organization. The double basket, 2-tier organizer is 17.85"H x 11.5"W x 21"D. please measure cabinet interiors and opening to determine fit.